Picenadol (LY-97435) is a 4-phenylpiperidine derivative that is an opioid analgesic drug developed by Eli Lilly in the 1970s. Picenadol is an effective analgesic with similar efficacy to pethidine (meperidine). It has been investigated for some applications such as obstetrics and dentistry, but never commercialised. It is unusual in that one enantiomer is a pure μ-opioid agonist, while the other is an antagonist. The (3R,4R) isomer is the agonist, while (3S,4S) is antagonist. This means that the racemic mix of the two enantiomers is a mixed agonist-antagonist, with relatively low abuse potential, and little of the κ-opioid activity that tends to cause problems with other opioid mixed agonist-antagonists such as pentazocine. ↑ Sherline DM. Picenadol (LY 150720) compared with meperidine and placebo for relief of post-cesarean section pain: a randomized double-blind study. American Journal of Obstetrics and Gynecology. 1983 Oct 15;147(4):404-6. ↑ Goldstein DJ, Brunelle RL, George RE, Cooper SA, Desjardins PJ, Gaston GW, Jeffers GE, Gallegos LT, Reynolds DC. Picenadol in a large multicenter dental pain study. Pharmacotherapy. 1994 Jan-Feb;14(1):54-9. ↑ Leander JD, Zimmerman DM. Effects of picenadol and its agonist and antagonist isomers on schedule-controlled behavior. Journal of Pharmacology and Experimental Therapeutics. 1983 Dec;227(3):671-5. ↑ Froimowitz M, Cody V. Absolute configurations and conformations of the opioid agonist and antagonist enantiomers of picenadol. Chirality. 1995;7(7):518-25. ↑ Zimmerman DM, Smits SE, Hynes MD, Cantrell BE, Leander JD, Mendelsohn LG, Nickander R. Picenadol. Drug and Alcohol Dependence. 1985 Feb;14(3-4):381-401. ↑ Martinelli, M. J.; Peterson, B. C. (1990). 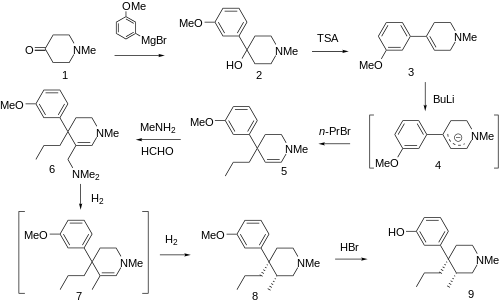 "A concise, stereoselective synthesis of picenadol". Tetrahedron Letters. 31 (38): 5401. doi:10.1016/S0040-4039(00)97857-2.